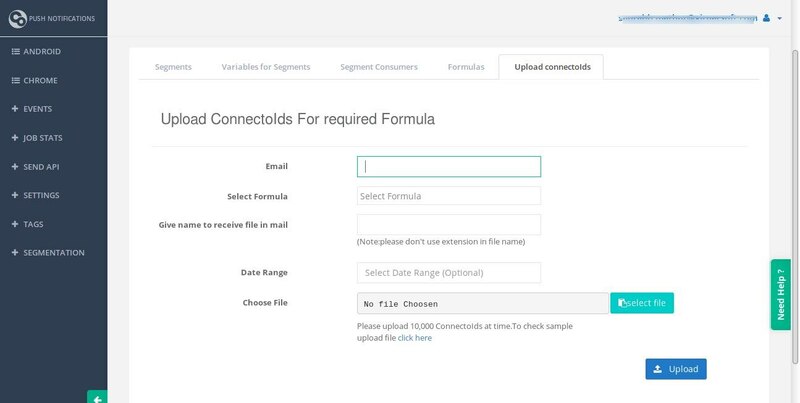 In this blog we will walk you through how to upload connectoIds for required formulas. You created some formula in your site and also you know connectoIds which are qualified in that formula but you want to know user actions(here actions means how many times user visited a particular page or how many times user qualified the particular url..etc based on your formula created.) in that formula then you can use upload connectoIds to get those data. In this you just need to upload the connectoIds as a csv file and you will get the Download link in your requested mail through which you can download the csv file on your machine. Login to your Connecto account Here —> segmentation section —> Upload connectoIds tab. Enter the mailId on which you want to receive the downloading link. Select the Formulas on which you want to group the users. You can select one or multiple formulas. File Name is optional parameter. Provide the Name to the file which you will receive from connecto. (Note:please don’t use extension in file name). Date Range is optional parameter. If you want to get the data within specific date range then you can select start date and end date. Select file which contains ConnetcoIds, you can upload a file containing ConnectoIds upto 5MB at time. Once upload is clicked then you will receive mail on requested mailIds with a downloaded link for the file containing the result.